Pups - Griffology...where every paw counts! Questions before getting a new pup! These are some wonderful things to remember when you are beginning your search for you new Griffon puppy. Here is a list of questions a puppy buyer can ask of their breeder. The interview process is not only for the breeder to get to know a prospective buyer. It goes both ways and it is important to ask the right questions. 1) Health clearances on both parents: PennHip scores, CERF eyes, Thyroid at a minimum. It is also important that a breeder can tell you about the health of the grandparents, great grandparents, etc., average longevity of their litters, etc. 2) Temperament evaluation of both parents, grand parents, great grand parents, etc. How are they in the house, how noisy are they (are they only vocal when they play, vocal with strangers, vocal when distressed, etc.) How are they with other dogs, small pets, children. How sensitive are they? How independent are they? How cooperative are they? How motivated are they? How destructive are they? 4) What is their vaccination schedule? What is their deworming schedule? How did they decide upon that schedule? What has the mom been fed and why? 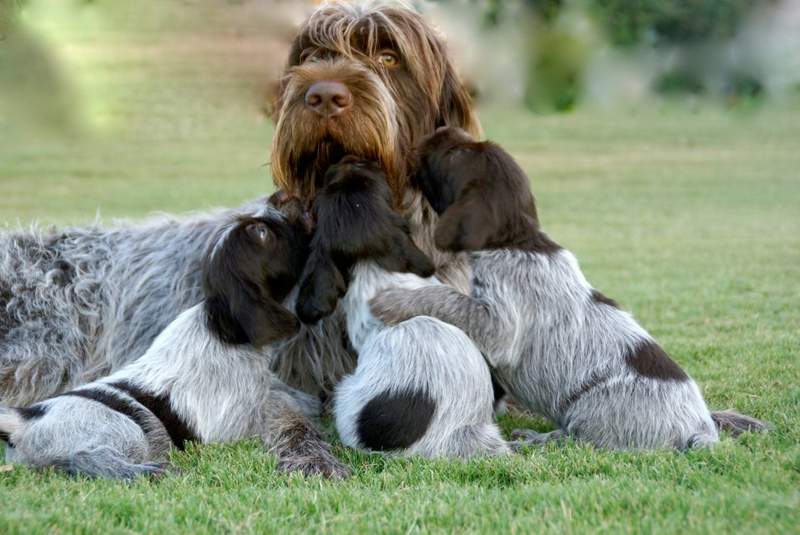 5) Post natal care: How long were the pups with mom? When did they introduce solids? At what age will they be leaving mom? At what age will they be leaving for their new homes (early is not necessarily better) and why? 6) Socialization: Are the puppies getting regular exposure to children? Noisy households--vacuums, blenders, washing machine, television, etc.? Do they have appropriate quiet time if they are being raised in a busy household? Are they being regularly exposed to strangers? If so, what precautions are the breeder taking to make sure that they are not exposed to parvo, coccidia, giardia? 7) Contracts---what is the health guarantee? What is the return policy? What is the lifetime policy if a pup needs to be rehomed at ten years old plus? What is your recourse if the pup arrives with an infectious disease, etc.? 8) Support: What support does the breeder offer in the way of behavior, crate training, leash training, house training, grooming, diet? How experienced is the breeder in helping new owners to be successful with their new Griffon puppy? How much time will the breeder offer to a new owner and will that time be productive? 9) Videos, references, physical introduction: Any breeder should invite you to meet the dam and brothers, sisters, aunts, uncles, grand parents, cousins, etc. If you are not able to travel, then the breeder will have unedited video of their dogs in the field, in the home with children, with other dogs, livestock, etc. A good breeder will also offer you from 10-20 referrals from other owners who have puppies from their program and who are glad to tell you all about how happy they are with their Griffon or Griffons as well as valuable information about temperament, habits, etc. 10) Hunting verification: If you are interested in hunting your Griffon, the breeder will invite you to hunt and shoot over their Griffons. Period. In season or out of season, every state makes provisions for training out of season and if you can make the time and arrangements to come meet the breeder and dogs, the breeder will have dogs present to take you hunting over. If you cannot hunt with the breeder in person, then the breeder will provide unedited video of their dogs in the field. A breeder cannot adequately evaluate their dogs' hunting qualities for breeding if they do not hunt over their dogs. Hunting tests, trials and prizes don't count unless you plan to test, trial or prize your dog. And even so, these cannot be the only measure of a dog's talent in the field if you plan to hunt. Often a breeder can also put you in contact with owners in your area who will be willing to take you hunting with their Griffons. If the breeder cannot answer ALL of these questions and more, confidently and expertly, then a buyer should question what they are purchasing. Griffons from reputable breeders cost from $1200-$2500 and they should receive all of the above with their new puppy. If they are receiving any less from their breeder, then they should be paying a nominal adoption fee, not a full price for a puppy. Thinking about a rescue or adoption??? We are all sad to hear that someone has surrendered a dog to any kind of shelter. In early September the community members of Wirehaired Griffon Rescue started posting about a 11 month old pup up for adoption in my area. At one point someone even tagged me in the post. I contacted the very nice lady that had her up for adoption and by that afternoon I had my second Griff and my first little girl. I did my best to track down more information on her early life and all the shelter could tell me was that the man who surrendered her did it because she was too energetic. When I first heard this I was angry, but the more time I spend with Daphne, the happier I am that our paths crossed. I know that her early life may have not been very good, but we are doing our best to give her the best griff life she can have now. It has been three months since I met this wild child. The plan was to work with her and maybe have her ready by next hunting season, if she would hunt at all (It was okay if she didn't, we have pets only too). As with all things, plans quickly go out the window. Daphne fast tracked herself and two weeks after opening day of upland season, she was being shot over on wild birds, looking as if she had started training months earlier. This weekend she set in the her first waterfowl blind and the energetic puppy that some person gave way, sat rock steady with her eyes on the sky. The first goose was kind of a surprise to her but after that it was a proud moment watching her return to the blind time and time again with birds that look as big as her. The man that thrown her away had always been known to us as the jerk, but now he can only be considered the fool. The man had given away what could have been the best dog he ever had, if he had taken the time to get to know her. His loss, our gain.